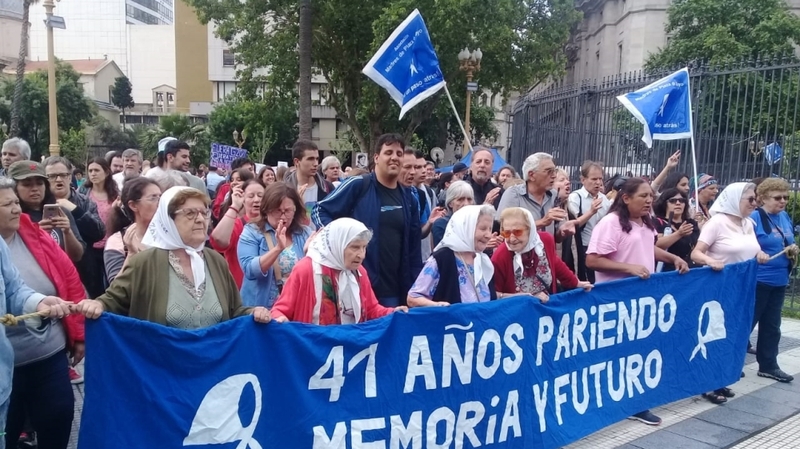 Mothers of Plaza de Mayo hold 2120th march, demand return of those forcibly disappeared during Argentina’s dictatorship. Buenos Aires, Argentina – Every Thursday since 1977, a group of women march around the Plaza de Mayo, the square in the Argentine capital Buenos Aires, where the presidential palace is located. Tens of thousands of people were forcibly disappeared during Argentina‘s last dictatorship (1976-1983). Many have been confirmed dead, the whereabouts of others remain unknown. “There are places here where children don’t have bread or meat, and the politicians are busy worrying about taking each other’s jobs,” Hebe de Bonafini, president of the Mothers of Plaza de Mayo Association, said of the upcoming summit. The crowd responded by saying “presente” to symbolise that each person was present among the group. Three of de Bonafini’s children were disappeared during the dictatorship, but she doesn’t speak about their stories because one of the mothers’ guiding principles is the socialisation of motherhood. They aim to represent all of those who lost their lives fighting for democracy, rather than specific individuals. De Bonafini and the other mothers in the association also refuse to receive any kind of compensation from the government. “You can’t put a price on life, especially not the life of a revolutionary,” she said. In the early years, the mothers had to march in small groups – often in pairs – to avoid being arrested. Just a few months after they began their protest in 1977, a man infiltrated the group by pretending his brother had been taken. Three of the most active mothers – Azucena Villaflor de Vicenti, María Ponce and Esther Ballestrino de Careaga – were arrested, tortured and thrown from planes into the sea. The love, courage and determination of these woman outshines the G20 meetings by billions of watts.